The present JE Karma Trinley Rinpoche is recognised by H.H. the 14th Shamar Rinpoche when he was 4 years old. The 1st JE Karma Trinley Rinpoche was one of the greatest masters of the last 15th and early 16th century in Tibet. 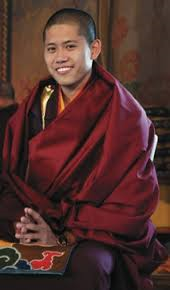 He was a student of the 7th Karmapa Chodrag Gyatso who was his root guru and a teacher of the 8th Karmapa Mikyo Dorje. He also played an important role in the Sakya tradition and received numerous teachings of Sutra and Tantra from various transmission lineages, including Shangpa Kagyu and Drugpa Kagyu. Among other works, he wrote a commentary on the Dohas (vajra songs) of Saraha - the great Indian master of Mahamudra - and his own songs.